The series won the 2011 Newtype Anime Awards for Best Anime Film. I was excited when a fansub of this film was finally released. The first film remake of Macross Frontier was actually not that bad. It was enjoyable, and the changes they made from the original anime were interesting. This film follows the first. It's immediately clear that a considerable amount of money went into the production of this film. The CGI effects are a step above what we saw in the original anime. There's more detail, the fights are faster and more frenetic, and the animations are all much more convincing. The battles are fantastic. The music's quality continues to be near the top of anime music. The characters themselves suffer from the same inconsistency in their drawings that's plagued this series since the TV anime, but it's become part of its style at this point, I suppose. I'm not a huge fan, but it's digestible. Everything is so far so good. Then the movie continues its narrative, and things immediately starts to go downhill. The story continues where the first film left off. More details are revealed about the characters' origins. They're different from the TV anime, and in some aspects more interesting. In others, they're horribly convoluted and feel contrived. The conspiracy to control the Vajra returns, but with immense amounts of absurdity and contrivance added to ensure this film fails. That's the part I don't understand. The writers jammed so many twists into this film, and featured so many unkillable characters making surprise reappearances, I had to keep myself from fast forwarding between battle sequences. The unkillable characters reach Sunrise anime levels. The story barely ends up making sense at the end. The end itself is fairly interesting, but they take the most inane and unintelligible route to get there. Even for Japanese anime, which is notorious for ambiguity and stories that end terribly, this film manages to reach its own depth of utter nonsense. 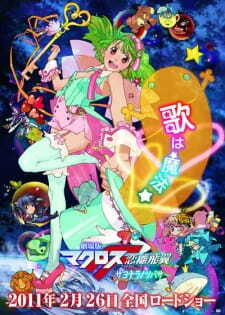 There's a scene where the main cast from the SMS dress up and play instruments on stage with Ranka. Michel plays a guitar. Kanaria plays drums. Clan plays what I presume to be bass. She shoots darts loaded with tranquilizers from the neck of her instrument. Near the end, the Macross Quarter surfs into the atmosphere of a planet on an enormous piece of ship hull. The main characters all "die" at least twice each throughout the course of the film. Words cannot describe how let down I was by this movie. If you're a fan of Macross, it's worth watching at least once for the battles. Personally, I can never get enough of Macross-style action with the missile trails and transforming fighter planes. This movie, though, managed to get me to delete it as soon as the credits hit. It's amazing. Remember my Evangelion anecdote in my Macross Frontier Movie 1: Itsuwari no Utahime review? If not, let me recap. Evangelion had 3, soon to be 4 rebuild films that got progressively strayed from the original anime, the more the rebuild story went on, to the point that movie 3 was something new in its entirety. It's a similar thing here. Itsuwari no Utahime partly recapped the first 10 episodes of Macross Frontier, and then strayed away for the film`s second half. This film, Macross Frontier Movie 2: Sayonara no Tsubasa or the equally awesome English translation, Wings of Farewell, is a new story in its entirety. So, with the final installment to this 2-part ambitious project, did they put off a stellar farewell performance, or did they come crashing down into the crevasses of forgotten stardom? Let's find out, shall we? Your enjoyment of the story comes down to how much you can handle all of the many twists and hidden agendas this movie throws at you. It rivals Code Geass R2 in the amount of those present here. Back in Itsuwari no Utahime, Sheryl and Grace were suspected as spies from Macross Galaxy. This movie finishes what THAT film started. It turns out that like in the show, Sheryl has been afflicted with a fatal Vajra illness, and she'll eventually die, so Grace O'Connor wants to take her and her career out in one fell swoop. Luckily, Leon, whose role is somewhat changed from his villainous role in the show, brings this case back up, eliminates most of Grace's men, shot Grace multiple times, arrested Sheryl, and started a manhunt against a guy named Brera Sterne, a guy being controlled by Grace herself. Fed up with Sheryl's arrest, Alto, the rising star Ranka, and various members of Frontier's military team up to bust her out, and eliminate the still present Vajra threat. Unfortunately, Grace's body is brought back by Leon, thinking he still has a use for her. Considering the bullet her minion Brera Sterne put on Leon's head, it's safe to say it didn't work out well. Also, if there was anything recycled from the show during this movie, it would be the remaining sides during the final confrontation, seeing as there were four sides to this epic battle of wits and conquest. Also, this movie, like Code Geass R2, pulls an ambiguous ending, leaving you to speculate what truly happened. There's already enough spoilers on the review as it is, and I won't add any more. One of the biggest sections of dramatic tension, is Sheryl's arrest. She's heartbroken knowing that her career is going to end, and she's going to die, weather the illness or the new death sentence placed on her arrest kills her first. Luckily, she's even better than her portrayal in the show, with slightly more depth in this incarnation. Ranka is the same as before, and so is Alto, except for some choices he makes, even if it's pretty much confirmed that at some point after the ending of this film, you know, when he gets back home from his crazy decision, the Alto x Sheryl ship will set sail. Everyone else is the same as in the show as well, except for Leon. He is no longer a backstabbing villain who gets confronted near the end of the show with no further punishment. This time, out of the four sides, he's the second best, aside from the protagonists of course, only this time, HE gets backstabbed, or rather, shot. The art in this movie is astonishing. What's with 2011 products looking so damn amazing? Both this, and Fate/Zero look absolutely magical, especially for things that came out 5 years ago, at the time of this review of course. The performances are marvelous and full of life, the CG looks stepped up from the show, and even more amazing than before. The mech fights are some of the best I've ever seen. So much beautiful flashy effects everywhere, it's just breathtaking! Nothing looks bad, and it's just a marvel to look at. It's like being up close for a fireworks show, only, no side effects like smoke or whatever. No track is less than stellar in terms of vocals. Sure, the background music sounds just OK, but the vocals are the best in the series. Kindan no Elixir and Sayonara no Tsubasa are some of the best performances ever, and Ranka`s performances are no slouch either. You have to listen to these songs for yourself. Also, a majority of songs are new this time around. I still listen to Kindan no elixir from time to time. It is that good. The twists were enthralling, the action was amazing, and the music was just beautiful. What else do I need to say? If I can put up with some of the worst subs I've ever seen, just for this movie, that`s a testament to how much I loved this film, even if some of the twists are a bit more disagreeable than others. It was definitely the most fun I've had with Frontier as a whole, as well as some of the most fun I've had with the franchise period. There's not much left to say. This movie was epic. It truly brought a great conclusion to the series, and is a worthy addition to the franchise. Sure, not all twists were great, but they kept me at the edge of my seat, along with the amazing songs and battles. Sure, this movie is a bit more divisive than the first, despite it having a higher score than the first, but it was a real treat, and you should definitely watch it if you have watched movie 1 already. With that, I bid you adieu. The second part of Macross Frontier's theatrical version. What can I say? If you've seen the series and the first movie you know what to expect. Strangely enough the love triangle here is finally resolved! Yes RESOLVED - after the series' rather indecisive ending - which was left like that so as not to piss off half of their fanbase. Now that the frontier chapter is over though and cinema tickets have been purchased nobody cares about the disenfranchised lot who are probably now embarking on a host of collective suicide gatherings and poster bonfires. If Nuclear reactors ran on cheese then this movie would be Fukushima - non-irradiated people like myself can actually sit through it if we take the time to remember that a) and b) are worth watching - so much so that c) and d) can be overlooked. 'thing' that made Alto chose that girl. just got out from that VAJRA, the movie would be more dramatic.